I was recently working on an application that centred on the Huddersfield Contemporary Records (HCR) CD label as part of my new role as Director of the Centre for Research in New Music (CeReNeM) at Huddersfield, which I formally take on starting in August. 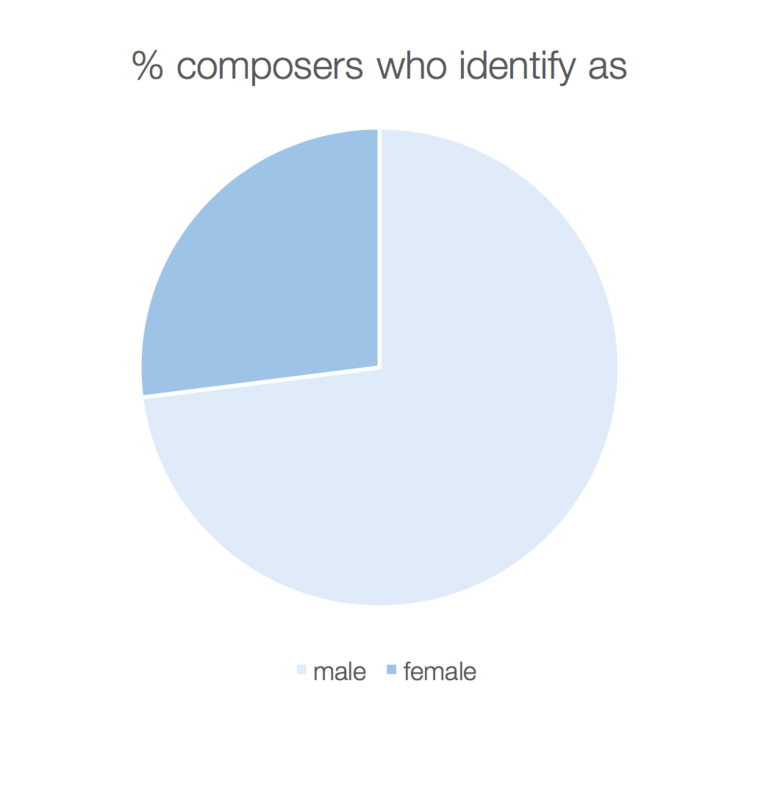 One of the pages in the application was a list of composers whose works have featured on the label, colour-coded to try to highlight both the gender balance and international diversity of the label. Looking at the list, my impression was, instinctively, that there was something to be proud of, that we seemed to have a pretty good gender balance across our releases. I’m told this is a common phenomenon around issues of equity and equality. In the words of my colleague Liza Lim, paraphrasing a study on the ‘gender perception gap’ from the Geena Davis Institute for Gender in Media, ‘17% looks like 50%, and 30% looks like 70%’. Seeing the raw truth of the data staring back at me, it was absolutely, immediately, unequivocally clear that, despite my instinctual impression, in truth we still have a long way to go. To that end, as my first formal act in the new role as Director, I’ve committed to establishing a 50/50 gender balance of composers across HCR’s CD catalogue within five years. And indeed I made that commitment explicitly on the application. It was a risk, in some ways, but I felt that making that commitment, and making it publicly, was crucial—I wanted to hold our collective feet to the fire. It means, of course, that we will need to actively redress the imbalance. There are a few exciting future releases in the pipeline that are already part of our existing plans that will help, but on their own they’d only move the needle incrementally. And the data above makes it clear that the gender perception gap can trick us—and I suppose by ‘us’ I mean ‘me’—into complacency. Slow, incremental moves aren’t good enough. We’ll need to make a very serious, concerted commitment to meet the target, but it is absolutely clear to me that it’s a target that needs to be met. And I’m posting this here to make sure we’re held accountable. I am of course aware that this particularly binary approach to gender is itself problematic and outdated, and I’m also acutely aware that racial and ethnic diversity is as problematic for our label as it is across the field of contemporary music, and those issues will also be part of our conversations going forward. As much as I’m embarrassed that we’re in a position where this kind of project is necessary, I am legitimately excited by it, and eager to get to work.